Our class has been tracking the sunrise and sunset times. We get these from The Hindu newspaper. Aunty found out from the internet the sunrise and sunset times for the first weeks of January and June of this year. 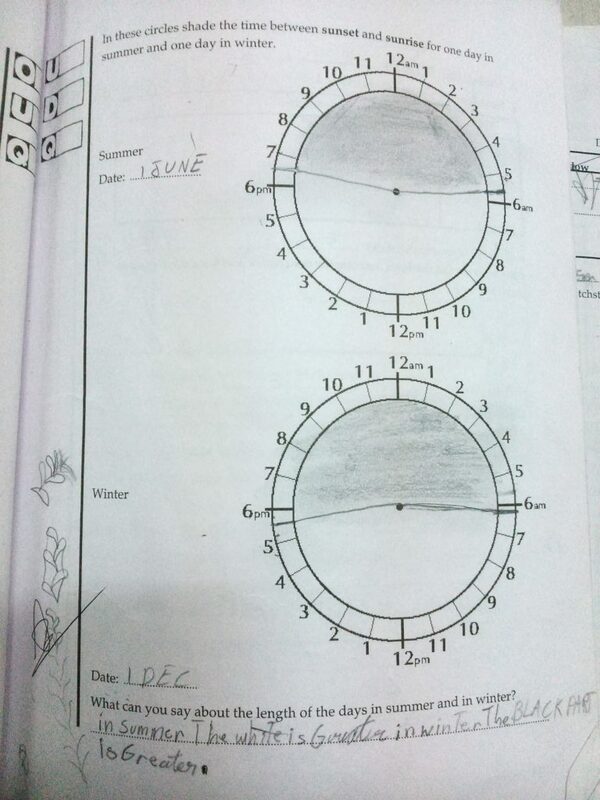 We did an interesting exercise in the workbook where we had to mark two circles with the sunrise and sunset times for one day in summer and one day in winter. 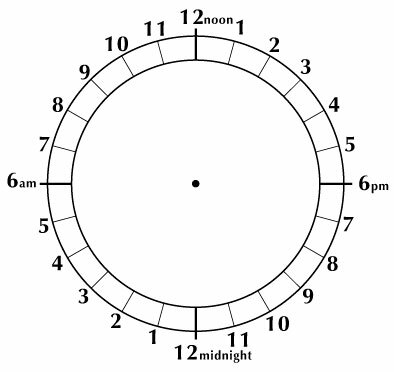 When we shaded the parts of the two circles between the sunrise and sunset times, we saw that the days in summer were longer than the days in the winter. 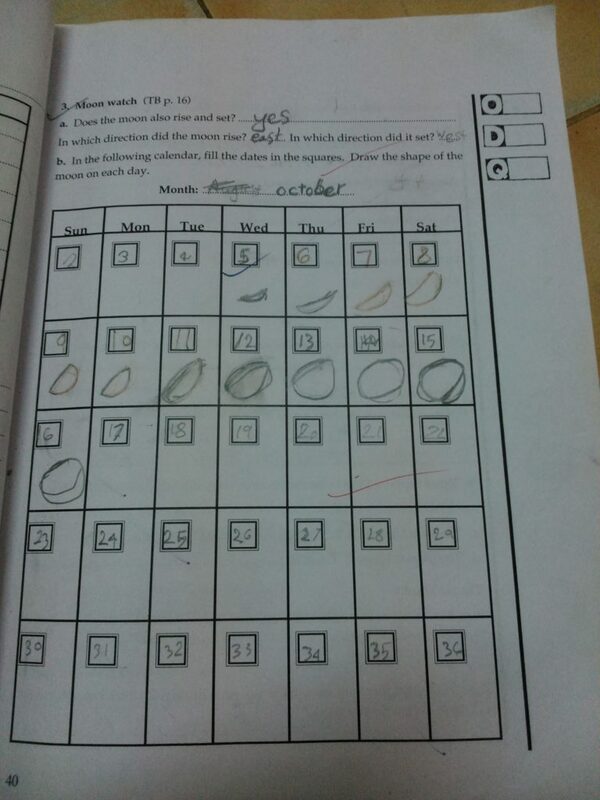 Despite these small frustrations we (the teachers) thought the challenge was good for the children — it helped them in learning to decode written and slightly complex instructions, and in precisely counting and marking divisions. The final picture with the shading was very satisfying. 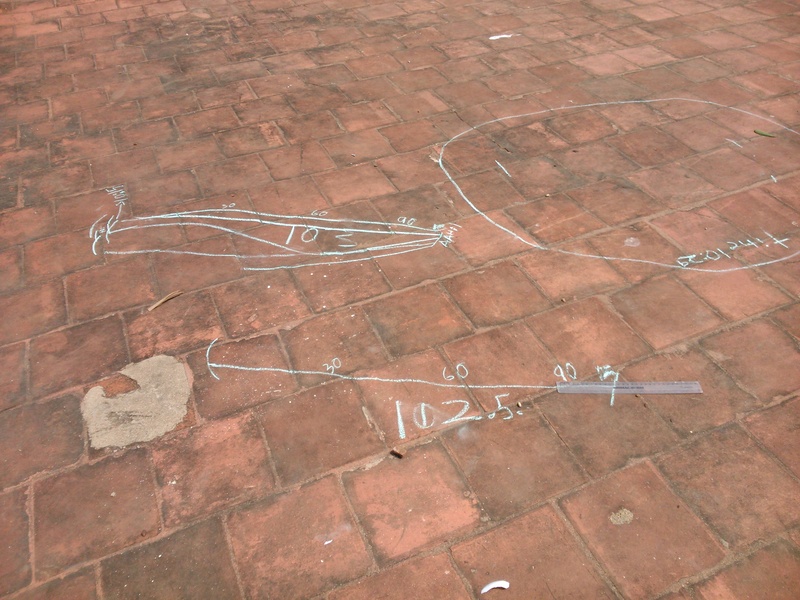 In the next class, we broke up into teams and went to the terrace to measure our shadows. Around 11:45 am in early October the shadows were very short. We were confused about where to start measuring and where to stop; we could not tell the shadow of the head from the shadow of the shoulder, till someone had the bright idea of tapping on the head and watching the shadow of the tapping. We marked the shadow and did it again in the afternoon when the shadows were longer. Then came some cloudy days so we couldn’t do the experiment with the matchstick and its shadow. 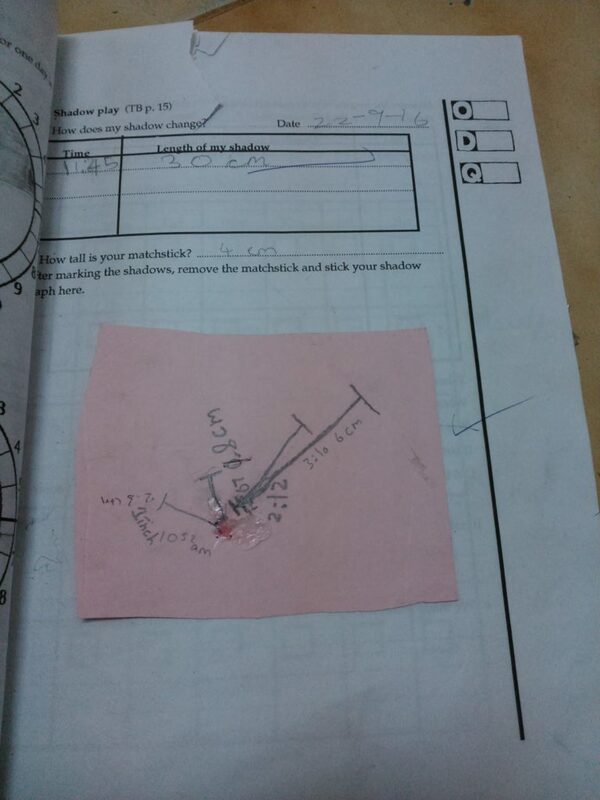 When we did do the experiment, we initially stuck a pencil into a ball of plasticine and put it on a chart paper. But later when we went to measure the shadow, we found that the wind had blown the pencils over — and we couldn’t figure out where exactly we had placed them the last time. So we repeated the experiment. 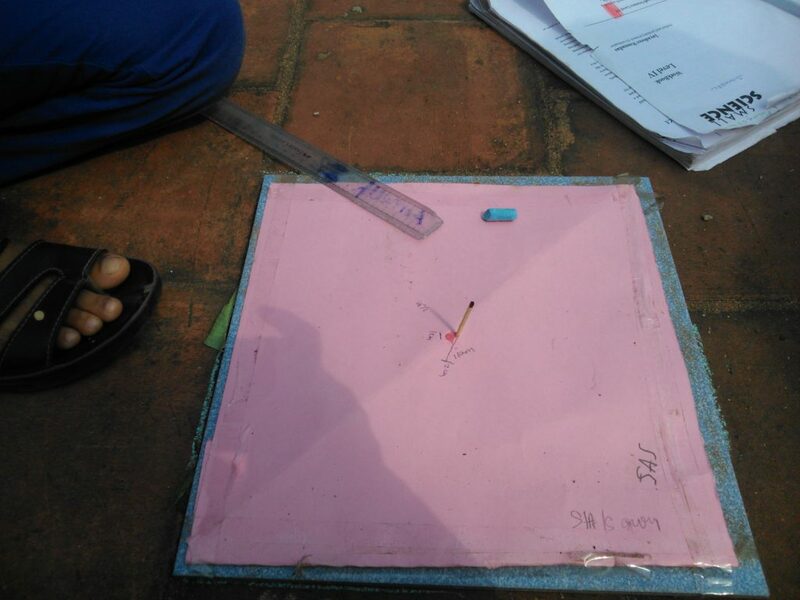 We stuck chart papers on to tiles and glued matchsticks using fevicol onto the chart paper. This way both paper and matchsticks remained in place for the whole day. Each team recorded the length of the shadow and measured it using a ruler. It was lovely seeing how the shadow of the matchsticks first grew smaller and then longer. Aunty told us to keep watching the moon. One evening, around sunset, she sent a message to our mothers asking us to look for the moon on the West. So about half of us had seen the moon when we came to class the next day. It was a thin crescent moon — the month of Muharram had just started — it’s our new year. Aunty asked us to draw the moon on the blackboard. Ameeth had seen the moon; he drew the crescent, as in A. Aunty asked us if this was what we had all seen. We weren’t sure. She drew three other orientations of the crescent and asked us to tell which one we had seen. Many felt it was A, but some thought it was B. Others said it was C or D. Jayashree Aunty asked if we could guess, from where the sun was (setting) the shape of the crescent moon. Some of us knew that moonlight is really the sun shining on the moon, but we had no idea what this had to do with the shape of the moon that we see. Finally Aunty told us that the shape we had seen was most like C, and asked us to check it out again that evening. She told us whenever we see the moon to check where the sun is at that time, and from which side it is shining on the moon. We discussed how the ‘star’ we saw near the moon was actually Venus, a planet. Safwan was quite excited at the idea that we had seen Venus. We also discussed constellations and how in ancient times people imagined shapes in the sky. Many of us had seen the Orion — it is quite easy to see in Chennai, especially if it is rising over the sea. We recognize it by its belt. Some had seen the Great Bear. Salman mentioned that he had seen the Pole Star by making a line from the Great Bear’s two stars. Aunty told us to go see the constellations tonight, and to look for the same constellation again after an hour to observe where we find it. Ameeth helpfully drew pictures for us of what he saw. 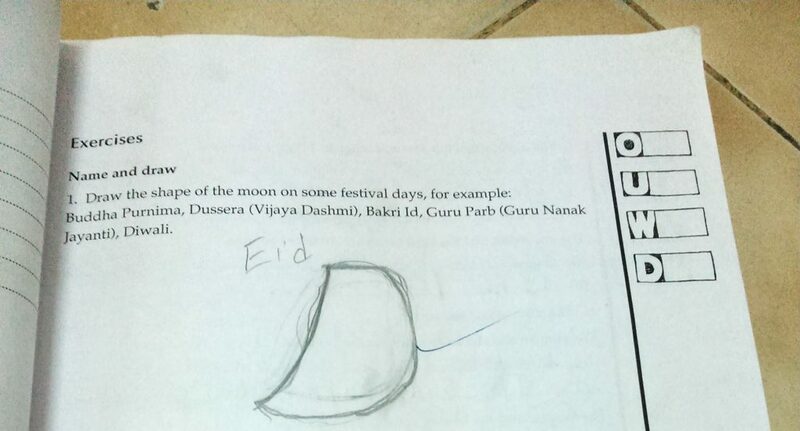 Today, we had to draw the shape of the moon on any festival date. We drew the moon on Eid. Aunty asked us which one we drew — Eid ul Fitr or Bakr Eid. The moon on Eid ul Fitr is a crescent moon but the moon on Bakr Eid isn’t — because that Eid falls on the 10th day of the lunar month. Aneesa Aunty asked us what kind of moon it will be. We knew it wouldn’t be a crescent which comes on the first of the month. * She asked us how the moon would look on the 15th of the month. After some discussion we agreed it would be a full moon. Then she asked what it would be like on the 10th. AHA! We guessed it was a gibbous moon. But there was some argument whether it was a waxing or a waning moon — growing bigger or smaller. 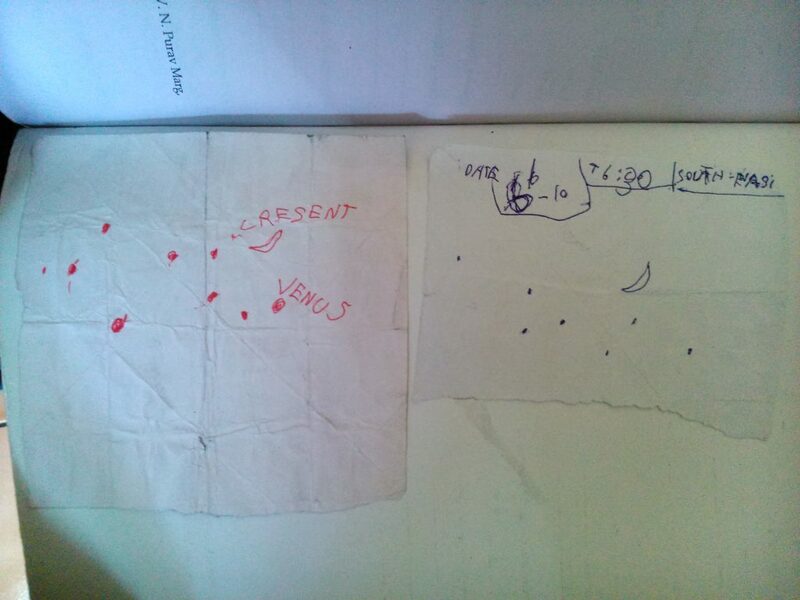 Aunty drew a timeline on the board from the 1st to the 15th with the shape of the moon on the 1st, 10th and the 15th. We then realised that the moon on the 10th would be a waxing gibbous moon. 1) It helped to message parents to remind the children to go see the sky and many of them did actually go. 2) The Moon watch chart has been stuck on the walls. 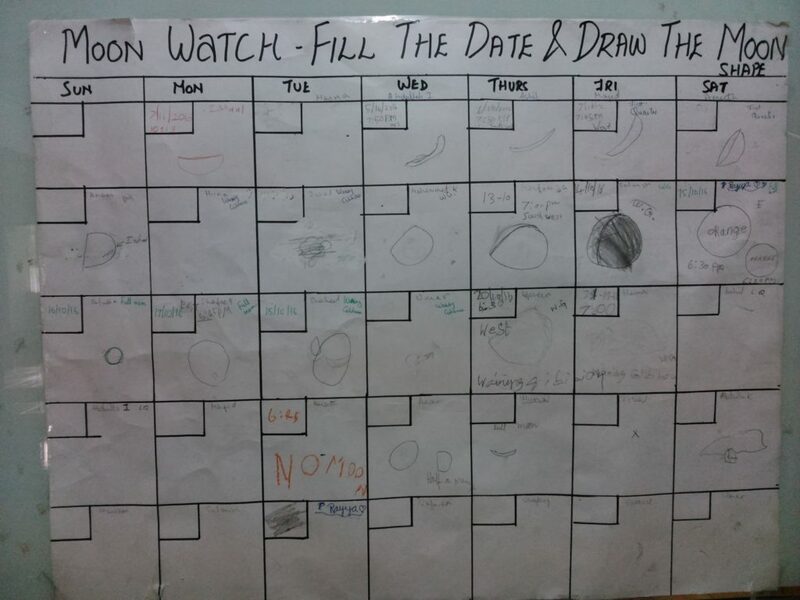 The responsibility for observing and recording the moon’s shape has been assigned to different students for each day. On the whole this makes them take ownership for the recording though the final graphic was less than clear. Over the coming months and years we need periodic observation and discussions for all the students to see the pattern of phases. 3) The similarities / differences questions can be challenging but interesting. Children often note things that makes sense to them but are not necessarily correct. Some interesting observations go beyond our imagination — like “moon and sun have the same shape” written as a “similarity” and “moon changes shape, sun doesn’t” in the “difference” section. Upon questioning, the child explained how “in space” the shapes are the same, while for us seeing them, the shapes are different. 4) The question about a lighted lamp looking brighter at night also brought out interesting observations. IAA said “yes, the lamp gives out more light.” I asked her if the lamp has more power or glows more at night. She then said “No” and realised that the light from the sun makes the electric lights look dimmer. 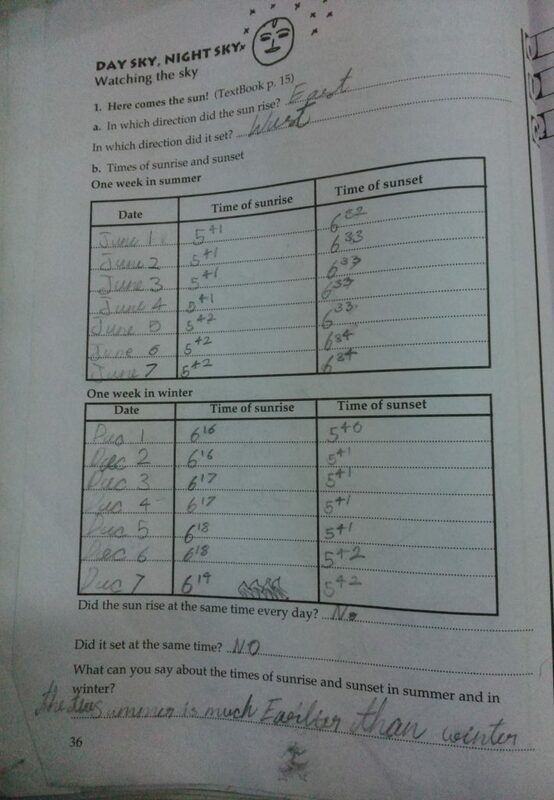 5) “Match the happenings with seasons / times / directions” is difficult, particularly when done as an exercise. While children often know or can find the answers through observation, when it comes to holding different possibilities in their minds and then matching, they make mistakes. This may be a limitation of working memory capacity, which could be overcome through guided observations over time. These questions would form a good starting point for project work. * The Islamic month starts on the day the first crescent is sighted, not on the day of the new moon. There is 'Small Science' in everyday life, and these little books empower you with this science, in terms readily understood by school children and even by grown-ups!